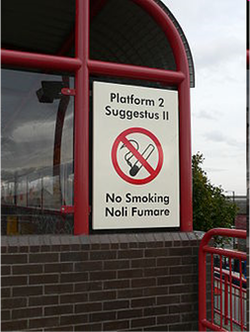 The Metro station at Wallsend (Segedunum) near the eastern end of Hadrian's Wall in NE England is perhaps the only public transport facility in the world with signs in Latin. In addition to bilingual signs such as the one above (which was still there in August 2013), the station was at one time also decorated with pictures of local buildings digitally modified so that names etc. were displayed in Latin, including `Viae Virides' for Greenways supermarket and `Forum Venalicium' for the Job Centre. The design was the work of artist Michael Pinsky . Additional information on the project can be found on the Best in Heritage website and a video report (with some Latin dialogue) is available here. The station is only a few minutes' walk from Segedunum fort with its extensive museum and reconstruction of a baths complex. The map below shows the entire Tyne and Wear metro system. South Shields, on the other bank of the Tyne, is the site of the Roman fort at Arbeia, which now has reconstructions of the west gate, the commanding officer's quarters and part of a barracks block,. The US-based organisation Earthwatch organises teams of volunteers each summer to assist in the ongoing excavations at Arbeia whilst staying in a local guesthouse - details are available on their website. For information on all sites in Roman Britain see the `Places' index of the Roman Britain website. A six-minute documentary on Hadrian's frontier policy and the construction of the wall is also viewable on Youtube as also is a 3-part record of a hike along the line of the wall from Carlisle to Newcastle, ending up at the Segedunum museum. A 2003 Observer article describes a hike along the then newly-opened Hadrian's Wall Path in the opposite direction (East to West). Photographs marking a 2013 exhibition on the history of the Segedunum excavations can be viewed on the BBC site. A collection of letters written by Roman army officers and family members at a frontier fort around twenty years before the Wall's construction, can be read on the Vindolanda Tablets Online site. Newcastle University is currently (October 2014) making available a free course on the archaeology of the Wall and the surrounding region. Although the course started on 22 September, previous episodes will remain available to those who register fro the course before it ends (2 Novembe 2014).